Advantages of Dedicated Email - What's in it for you? If you have an email list with thousands of subscribers it’s quite likely that they are from many of different sources. From social media, your blog, landing pages, email forwards and who knows. I’m sure that you grabbed their attention with different headlines, channels and content in the first place. This makes your list very diverse. You will have leads that you are able to convert right away with just a little push and you have those who need months and maybe dozens of call to actions to finally take action. Therefore you have to segment your list. We have talked about the importance of segmentation and personalization before, so now we are going to show you how the actual targeted / dedicated email should look like. It is tempting to include everything in an email, and let customers choose from a bigger pool of products or services you offer. But today’s users are so flood with information that they are less likely to care about an email full of “marketing buzz”. Dedicated emails are called that because they are stand-alone pieces, informing your target audience about new offers, events, new content like white papers or bait products you came up with. But in one mail you only introduce one of these. If you roll out a new line of products with varying prices and purposes, you should take a look at your list and create dedicated emails based on your data. Then send those out to the subscribers who will be most likely interested. This is also useful because you will have fewer unsubscribes, since you won’t bombarding thousands of people with offers that are not relevant to them. Dedicated emails are very easy to build. As they have one main focus, you only have to create a few templates in your responsive email editor that you can reuse in future any times. You should create different email templates for products, special offers, announcements, events, etc. As we discussed in our previous blog posts you should place your CTA carefully depending on the complexity of your offer. But really you don’t have to spend that much time editing the emails. Also, they are a much simpler in design than newsletters for example. You don’t have to create separate blocks or throw in too many graphic elements, but focus on the offer, the information itself. Make sure it is familiar, it is responsive and aesthetically pleasing, and you are done. Every time you send out a new dedicated email you just have to open you responsive email editor and grab one of the templates you created earlier. 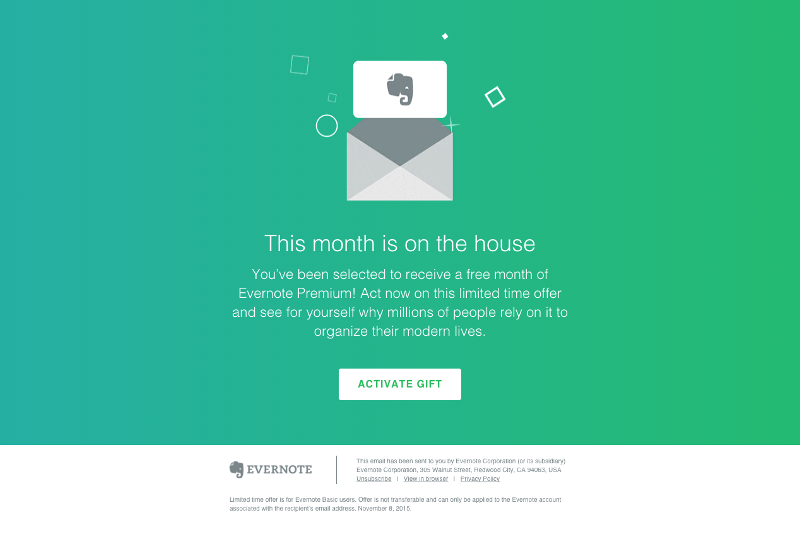 Here’s a great example from Evernote with a beautiful design, a playful anim gif and a straightforward CTA as the one and only conversion goal of the email. A big advantage of dedicated emails is that you can measure their effectiveness very easily. With one massage and one CTA you it is easy to track progress like click-through rate, conversion rate and number of leads this single email helped you create. Do not use dedicated emails all the time! Dedicated emails are also called stand-alone emails or blasts, and for a reason. They not only carry one massage but they are completely independent from any campaign you might be running. Dedicated email is a great tool to inform a narrowed target audience about a relevant offer. But most people will not expect these, and if you send them too often, they will most likely delete it right away and maybe even unsubscribe. You should use this type of marketing email **when you have something truly special. **Don’t make it feel like a TV-commercial, which is displayed several times a day. Never send out the very same dedicated email to the same people (who opened it at least). If you think a particular segment of your audience is going to love what you are about to say, send it. But if you want to retain customers, to nurture leads, educate customers, you should mainly stick to a long-term campaign strategy. For inspiration you may visit sites like Beautiful-email-newsletters.com and if you are stuck with a design, don’t get mad. Feel free to reach out to us for a helping hand! We may even build the actual dedicated emails for you with EDMdesigner.